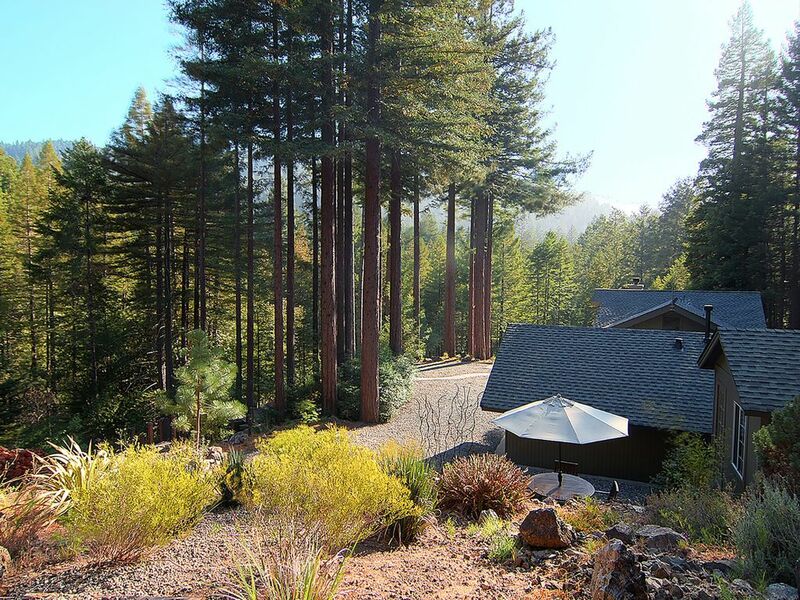 Elements is a private estate compound nestled on acreage in the magnificent redwoods of Sonoma County. Four detached buildings and expansive decking comfortably accommodates large groups. You'll be located within minutes of the beaches of the Sonoma Coast and the vineyards of the Russian River Valley, and be amazed by the solitude that surrounds you. The grounds have been landscaped with indigenous grasses and ferns, highlighting the phenomenal native redwood trees on the property, including a beautiful 500 year old redwood tree. Pathways and decks wind throughout, offering innumerable walks among ever-changing scenery, including a serene running pond, an antique stone masonry fountain, and an enchanting seasonal waterfall to delight and awaken the senses. When you hike from the main compound, pathways become forest trails beckoning further into remote adjoining terrains still on the property. Austin Creek, with its numerous swimming holes and opportunities for river wading, is delightful in summer and winter alike. The entire retreat is professionally lit to a stunning degree, complimenting its allure day and night. Entertaining is effortless and everyone can still have their own privacy, while gathering together in the large entertaining areas. All 4 bedrooms, with a total of 3 king and 1 queen beds, are furnished with quality linens and down comforters. There is also 1 queen pull out bed in the living room of the main house, as well as an inflatable mattress that can be used as needed. The main house is a contemporary craftsman structure with a great room combining the living room, dining room, and kitchen, a master bedroom with walk-in closet, and two bathrooms. The master bathroom has a large bath tub, and the other is exceptionally large with multiple shower heads and a walk-out to a Zen-inspired private garden. There is also an office with desk and printer. The fully appointed kitchen is centered around a granite island and can accommodate multiple chefs. Appliances include a professional six burner gas Wolf range/oven, microwave drawer, stainless refrigerator/freezer, garbage compactor, serving trays, and complete dinner service featuring the kind of tableware you might find in a high-end restaurant. A pantry offers a variety of seasonings and other basics. The main house is replete with fine attention to every detail, from the refectory-style dining table (comfortable seating for 8+), the deep Restoration Hardware leather sofa, to custom designed decorative Portuguese candle chandelier, which radiates throughout the main living area. The West Terrace, accessed via a large sliding door from the main house, is the essence of indoor/outdoor living and is an example of what makes this estate so unique. The outdoor kitchen and gardens were crafted from river stone years ago when the property was a summer campsite. It now includes a state-of-the-art gas BBQ, sink, lighting, and seasonal herb garden. It's an outdoor living room and is a great place to enjoy a warm day or cool evening in the company of friends and family. The original river stone fire pit is now the focal point of a modern and sophisticated outside entertainment area, including outdoor speakers controlled by your mobile phone via the Sonos Sound System. The outdoor dining table with seating for 14+ was custom made from the center cut of a local redwood tree. It’s the perfect setting for a large family gathering or a romantic retreat. The guest house has its own terrace and seating area. Its windows have beautiful garden views as well, but with different vistas, giving this two-bedroom space a unique atmosphere and privacy. It has two bedrooms, one with a king size bed, and one with a queen size bed, each with their own private entrance to the outdoors, connected by a common hallway to the bathroom. The spacious multi shower head bathroom offers a mini spa experience off a secluded and private patio. The “cabin” is everyone’s favorite. The pine-paneled interior is a classic recreation of the traditional summer camp cottage. It has its own bathroom, luxurious king size bed, and heated outside shower. The cabin also adjoins a very large deck with its own views of the redwoods and gardens. It's a secluded gem. This quaint structure is situated in the quiet of the lower gardens, accessible via a Japanese wood walkway. The deck off the back offers another sitting area with meditative views. The studio offers yoga mats, blocks, adjustable weights, mirrored wall and more. The yoga studio can also accommodate overnight guests if the need arises, using the provided inflatable mattress. It also has a Sonos sound system connected to the main house, controllable by your phone. At the center of the compound is the spa area, featuring a circular jetted hot tub situated in the center of an ancient ring of redwood trees. It’s truly a magical location: A soak in the Elements hot tub at night lets you link with nature and the starlit sky, a wonderful harmonious experience. There is a tranquility and peacefulness to this place that feels unique and special. It's one of those things that must be experienced to be appreciated. Not only does this deck perched at the top of the property offer some of the best views, it has this amazing restorative energy about it - it's difficult to describe, but many of our guests have agreed they can feel it too. Located throughout the property you'll find all the latest that technology can offer including three HDTV’s, a full range of cable programming (On-demand, HBO, Showtime, ESPN, Sports, and more), Blu-ray DVD players, and high speed internet (150 Mbps). In the main house, you'll find a 55-inch curved OLED HDTV with an Apple TV, full cable access, as well as access to free movies on Netflix, Amazon, and more. The property is served by an enterprise-grade wireless system, with range throughout the grounds including the decks. In-wall USB chargers are available in all bedrooms and the office. A Sonos sound system, complete with Pandora, Spotify, Amazon Music, and more, offers music and entertainment in the main house, the Guest house, BBQ area, spa area, and the yoga studio. All of this technology is here to serve your real world reality while you enjoy the calm and escape that this retreat provides. A complimentary Level 2 EV charger is available for your use during your stay to charge your Tesla, Volvo, Volt, Leaf, or other electric vehicle. Please note that Elements is intended for quiet, relaxing vacations and not events nor parties. Please respect our maximum occupancy limits. There are many wonderful locations nearby for you to hold your special day, and Elements can make for an ideal spot for you and your group to relax and enjoy after your event. Also note that there is parking for 4 cars only, and no street parking is available. We live in the town of Sonoma, not too far from Guerneville and Elements. We lived in downtown San Francisco for the better part of a decade, and often spend summer weekends in Guerneville and Sonoma. We're absolutely thrilled to share our "home in the Redwoods" with you, a very special place. We've made numerous upgrades since acquiring the property in 2015. Our goal is to create a space that exceeds your expectations in every way. We ourselves make it up to Elements on a regular basis and love the serenity that abounds here. It's one of those places that you must visit to truly appreciate. We both work in the tech industry, but have found a calling in hospitality. We've been hosts on VRBO for over 8 years in San Francisco and Sonoma, having happily hosted hundreds of guests from around the world. Just as we love traveling the world ourselves, we love sharing what we can with travelers and hearing their unique stories. When we first saw Elements it was love at first sight. You really have to visit to understand the feeling of serenity that surrounds you here. We live in the city, and while we've come to love the convenience of it all, we immediately appreciated that Elements felt worlds apart from all that hustle and bustle even though it was a short drive away - we knew it was a place that we wanted share with family and friends for years to come. The western part of Sonoma Valley has a much milder climate, which is why its ideal for the Pinot Grapes. This area has a blend of fine wines and great food, along with a unique environment with the Redwoods and the Coast. We think it's the perfect balance of what Sonoma County has to offer. There is a tranquility and peacefulness to this place that feels unique and special. It's one of those things that must be experienced to be appreciated. The upper deck has this amazing energy about it - it's difficult to describe, but many of our guests have agreed they can feel it too. The views over the redwood forested canyon and the abundant sunlight is really all you need to reconnect with what it means to be alive. When was the last time you sat in a jetted hot tub surrounded by 100 ft tall redwoods? The experience cannot be missed. Be sure to check out our 500 year old "grandfather" redwood tree - this "dwarf" was among the few trees spared in the entire valley in the 1800s. The Elements features a chef's dream kitchen with a high-end Wolf® 6-burner industrial stove, All-Clad® cookware, microwave drawer, Keurig coffee maker, replete with all the small appliances, cups, glasses, and tools that any chef could ask for. And while you may be away from it all, you can stay connected at the Elements. With a fast internet connection and enterprise-grade wireless, you can stay as plugged-in as you want. Elements is also equipped with a variety of high-tech entertainment options, including a 55-inch curved OLED HDTV, a Sonos sounds system with speakers throughout the property, and Nest thermostats. Elements has a high-end cable subscription, replete with HBO, ESPN, Showtime, On-Demand Movies, and so much more. Additionally, the Apple TV has access to Netflix and several other apps and games. It's a great way to relax after a long day of exploring or wine tasting, or catch up on the game back home. Rain clouds in the forecast? Don't fret! Elements is also wonderful in the rain - the incredible Austin Creek valley is gorgeous, and you can hear the seasonal creek roar. We're also equipped with the latest technology to keep you warm and safe - the property is connected to a generator and high battery systems to ensure that you are never inconvenienced. There are four bathrooms spread across three homes. Two bathrooms are spa style with multiple rainfall-style shower heads. One has an outdoor heated shower. Elements sits on a ridge with views of Magic Mountain and the Austin Creek watershed. This property has its own seasonal streams and several waterfalls. Free local and domestic long distance and incoming service. Central forced-air heating in the main house and guest house. The property is equipped with high quality sheets, towels and duvets. Complimentary basket of wood included for both outdoor fire pit and indoor fire place. Gated parking available for up to four cars. High speed 150 Mbps service with an enterprise-grade WiFi system that reaches throughout the property. Yoga room with weights, yoga mats, mirrored wall, and more. Deep Restoration Hardware leather sleeper sofa and Gumps side chairs. Built-in speakers throughout the property (indoors and out) with a Sonos sound system and other high tech gadgetry. Features an in-door ice maker and chilled filtered water dispenser. Standard 12-cup coffee pot and two Keurig K-cup machines in the main house and the guest house. Pantry is stocked with a wide range of spices and cooking ingredients. The kitchen is equipped with: Bosch dishwasher, microwave drawer, trash compactor, refrigerator, 6 burner professional Wolf range, and oven. A large pantry comes well stocked with spices and basics. Large dining table with comfortable seating for 8 and a huge outdoor redwood slab table with seating for 14. High-end 55-inch curved OLED HDTV in Main House, two large HDTVs in Guest House. Apple TV with NetFlix also available. 200+ Channels of Sports and On-Demand Movies. There are two large screen systems, one in the main house and another in the guest house. Sonos cloud sound system with multiple built-in Bose speakers inside and out. Blu-Ray DVD player in the main house. Lending library with lot of great local hiking and travel guides. Tons of great board games in the living room. Tons of great board games. Upper terrace has a great view over the valley and mountains. Rentals in nearby Monte Rio. Two large entertainment areas adjoining the main compound with abundant seating. The West Terrace has access to the outside kitchen, lounge chairs and hammock. The jetted hot tub and its deck sit in the center of a ring of redwoods, a secluded distance from the main house. It and its adjoining gardens are discretely lit for night time enjoyment. We stayed here for a long weekend with our three grown kids & their spouses. This was a perfect space for such a gathering!! A great time was had by all! This was our second year and we love it! Very lovely main house with a welcoming feel. Room for others to have some space. There are so many thoughtful touches in the house that I cannot begin to describe. Loved the hot tub! Went down to the ocean (Goat Rock Beach..not far at all) which was a lovely experience. Breathtaking views. Hoping we can reserve next year!! A perfect getaway with every amenities! Could not have asked for a better experience! Room to gather and room to spread out! Stayed in and cooked as a group, made some-mores, used the hot tub, played games.....totally enjoyable! Safe for a toddler. Luxurious and cozy! I recommend this fabulous little compound to any group wanting together time. Thank you to the very responsive hosts. Not a single negative thing to say. Everyone was very comfortable. Hoping to return next year! Absolutely beautiful and tranquil location in the middle of the redwoods. We loved the different buildings, as it is perfect for obtaining a little privacy when you are more than one family staying together. Beautiful outdoor terraces and so quiet, that you really feel like being in the midst of a forest. For your kind information: during the day the temperature outside is very warm, but in the morning and the evening it gets quite cold and you'd definitely prefer eating inside the house. We're so pleased that you enjoyed your stay at Elements. We agree that Elements is a special place for families and groups with different buildings and spaces to gather and have privacy. As you note, ours is a Mediterranean climate - in the fall, travelers should expect pleasantly cool mornings and enjoyable warm afternoons. Layers are key! Elements Austin Creek is a majestic compound located on a five acre ridge above historic Austin Creek. Once you breathe the air and see the vistas you are aware of the profound spirit penetrating the property. This extremely private estate consists of four buildings and a spa thoughtfully situated among spectacular gardens and towering redwoods with breathtaking panoramic views of Magic Mountain and its adjoining watershed. Elements is a licensed rental with the County of Sonoma. Please support local tourism and ensure a safe stay by only renting from licensed vacation rentals. TOT Certificate No. 822N. An important note about maximum occupancy: Maximum occupancy is limited to 8 adults and a maximum of 4 cars. County ordinances prevent any larger gatherings and is monitored. If you're planning on hosting an event that would bring more than 8 guests to the property, please contact us first to arrange. You will waive your deposit if you hold an event for more than 8 people at the property without prior permission, in addition to being responsible for any and all county fines. Thank you for your understanding.